The Best Acrylic Makeup Storage..For Under £20! | Becky Alyssa's Beauty Box. The Best Acrylic Makeup Storage..For Under £20! I have a scary amount of uni work to do..so naturally I’ve spent the entire day browsing Ebay and snuggling my rabbit. And I found a whole bunch of wonderful and affordable acrylic storage I had to share! If you’re anything like me, you have way too many products to keep track of, so any kind of organisation is very much welcome. Bonus if you can get it for less than the cost of a MAC lipstick. Check out my finds below and add them to your Christmas list! 1. 24pc Lipstick & Lipgloss Holder: £2.47 (+ free P&P) – Since this seller ships from China, I ordered this for myself before going on holiday in September and it was waiting for me when I arrived home. Shipping took around 2 weeks which wasn’t too bad, especially for the price! The plastic feels thinner than most acrylic and plastic storage, but it happily holds a selection of lipsticks on my dressing table and definitely looks more expensive than it is. Only problem? I may need another one (or two) of these to house the rest of my lip products..
2. Jewellery & Makeup Tabletop Organiser: £3.52 (+ £1.19 P&P) – The perfect organiser for the makeup minimalist. If you don’t like having your whole collection out on display yet still want your daily essentials within reach, this little organiser is ideal for your desk, bathroom or dressing table. The different sized compartments are ideal for any lipsticks, foundation and fragrances you reach for on a day-to-day basis. I’m considering one for my bedside table as a home for my lip balms and hand cream, since I seem to knock them over all the time! 3. ‘Flower’ Lipstick & Liner Holder: £5.95 (+ £2.50 P&P) – The only other product from my selection that I already own..and I love this one too! I bought mine via Amazon, but it’s the same product as in the link above. This unusual flower-shaped holder is ideal for keeping in place all the miscellaneous pieces that go astray all too often. I use the middle sections for my eyeliner pencils, tweezers, nail scissors and liner brushes since they’re the perfect tiny size. The outer slots are big enough to house most lipsticks – I use it to keep my concealer stick, spot stick and mini Urban Decay Primer Potion in one place. A great pick for both small and large collections. 4. Stackable Acrylic Drawer: £10.95 each (+ £4.95 P&P) – One of the more expensive items on my list, though one or two of these drawers would be a perfect storage solution for a bathroom or on top of a dresser. These can also be used to store shoes and clothing if needed. The best thing about drawers is that it keeps your lovely products clean and free of dust that can build up quickly if you keep them in the bedroom or bathroom – I’m thinking about getting a drawer or two for my bathroom to keep my smaller items from getting splashed. 5. Stackable Convertible Storage System: from £10.65 (+ £7.63 P&P) – A very sleek-looking customisable holder – the listing is a little confusing, but from what I understand you can buy additional tiers and a lid separately. I’m a huge fan of any storage systems you can customise and add on to accommodate an ever-growing collection. 6. 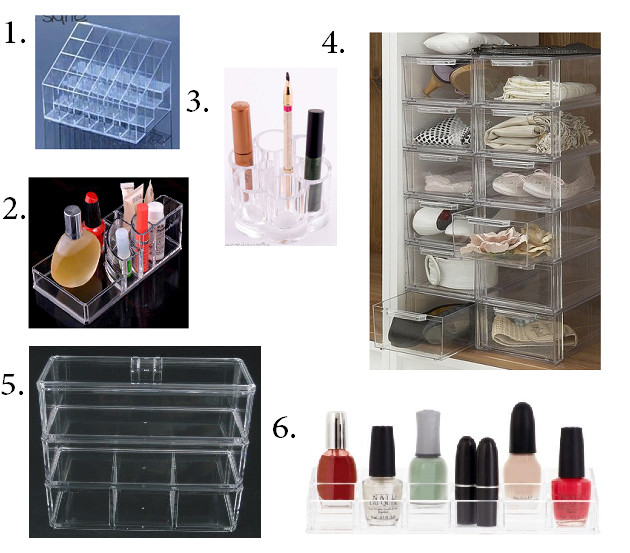 Nail Polish & Lipstick Holder: £7.95 (+ £2.50 P&P) – Unfortunately I need a much bigger system to store my nail polishes thanks to my enormous hoard, but this is perfect if you have a well-edited collection. Featuring 12 compartments, it could easily hold 12 nail polishes or 24 lipsticks to keep on display. Unfortunately the products pictured are not included! How do you store your makeup? Any brilliant storage systems or affordable storage tips to share?